AWS has pushed us in a new direction to do things we wouldn't have thought about previously. It has changed the way we look at things and driven us into areas we thought were out of bounds. Founded in 2010, amaysim is an Australian mobile service provider that sells SIM-only mobile plans. In five short years, the online-led business has grown to be the fourth largest independent mobile services provider and the largest Mobile Virtual Network Operator (MVNO) in Australia by number of subscribers, with more than 700,000 customers. The aging servers experienced outages and failed to meet performance requirements. These problems peaked in 2014 when the business experienced a 10-hour outage of the servers and systems that managed the call data records amaysim uses to generate invoices and advise customers of their mobile phone usage. With no extra capacity available, the outage caused a backlog that took four people working on the system eight days to resolve. In addition, as the business operated only a production environment—rather than than separate test, development, staging, and production environments—amaysim’s ability to test and develop new features was very limited. The business could only deploy new releases once a month outside standard business hours with all hands on deck, which restricted its ability to deliver new features to customers in a timely fashion. The business was aware of Amazon Web Services (AWS) since the cloud provider’s entry into Australia. When members from the operations team attended the 2013 AWS Summit in Sydney, they noted how mature AWS had become. In particular, the team was impressed by the innovation and creativity that could be achieved with AWS. “We heard first-hand what organizations were doing, not just in the production space, but how easily we could ramp up our development and testing,” says Dell. “Hearing companies like the National Australia Bank showcase their innovations gave us the confidence we needed to make the decision.” The business also based its decision on analyst reports about the cloud marketplace. The team was concerned that it did not have the skills and resources to manage its applications and services in a cloud environment. The business engaged AWS Partner Network (APN) member PolarSeven to help lead the implementation while training its own staff so they could be self-sufficient. After the launch on AWS, they used Bulletproof as a partner to assist additional skill sets where required. “In under nine months, we went from having no experience in the cloud to launching fully with AWS, and I was a keynote speaker at the AWS Summit Australia. The AWS team and supporting partners were extremely helpful in our migration and critical to our success,” says amaysim IT Director Lee Booy. 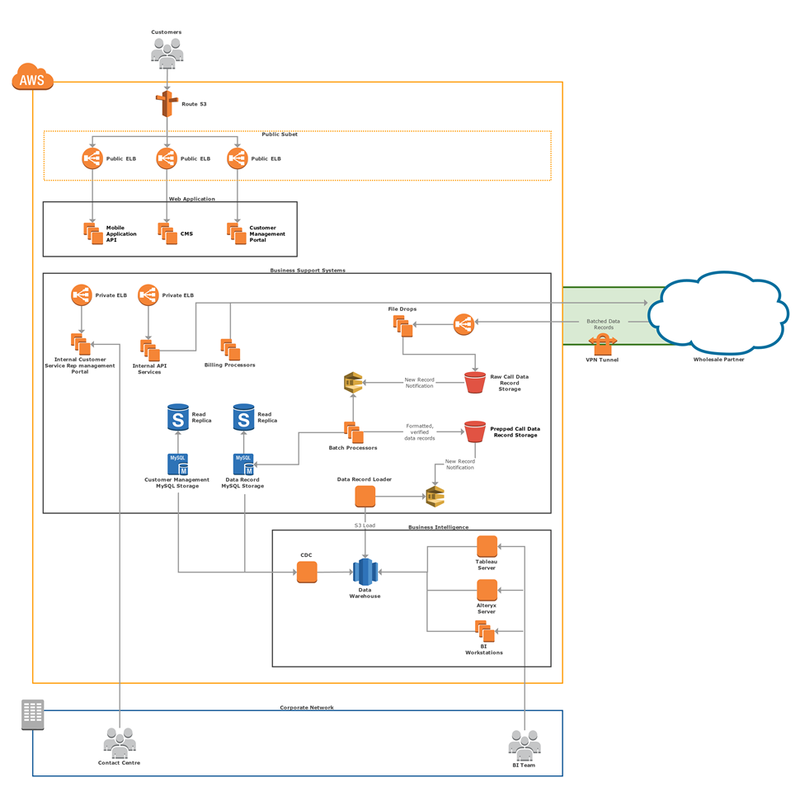 The business uses Amazon Elastic Compute Cloud (Amazon EC2) instances to provide compute resources, with Elastic Load Balancing distributing application traffic to maximize application fault tolerance. amaysim databases run in Amazon Relational Database Service (Amazon RDS), while customer and call data records (CDR) reside in Amazon Simple Storage Service (Amazon S3). Amazon Simple Queue Service (Amazon SQS) provides ordered communication between systems, while Amazon Simple Notification Service (Amazon SNS) provides push-messaging services to customers. The business uses AWS CloudFormation to create and manage new AWS environments from templates, while Amazon CloudWatch provides monitoring and alerts for the AWS infrastructure. Amazon Redshift operates as a data warehousing service that allows amaysim to gain a real-time view of its customers. By running its applications, services, and databases in AWS, amaysim has improved its flexibility, agility, and performance while maintaining its small operations team and empowering them to focus on their customers. The business has also achieved availability of up to 99.99 percent, and reduced what used to be week-long incidents to events that are resolved in under an hour. The flexibility of AWS combined with a move to a DevOps model, where developers and operations teams collaborate throughout the development lifecycle, has helped amaysim reduce application and service development times. Developers can now replicate an entire Amazon EC2 stack and have it operational under 10 minutes, while databases are replicated in an hour with easy-to-use configuration management tools. Additionally, amaysim can now deploy new releases weekly. The business has grown its customer base from 500,000 to more than 700,000 customers without adding more resources to its six-member operations team. amaysim has embraced an automation-first approach with tools such as Auto Scaling, which allows the business to manage demand spikes without manual intervention. Further, running on AWS has enabled amaysim to boost uptime and reduce stress levels on the operations and development teams. “When we launched our 4G services in 2015, a defect made it into production, causing a CPU to spike at 100 percent. In an on-premises data center, we would have had two unpalatable options—stop selling the service while developers worked on the issue, or defer the project launch date,” says Booy. But in this situation, AWS auto-scaled, adding additional Amazon EC2 instances until CPU utilization stabilized at 60 percent. The team was notified immediately and was able to investigate while customers continued making transactions without interruption. The team released a fix two days later. “The total cost of the incident to our business was AUD$64,” says Booy. “With the flexibility and scalability of AWS, we have changed the way we approach many aspects of development and operations. We can now turn critical incidents into notifications, allowing my teams to work on issues in a calm and proactive manner, which has reduced on-call time and burnout,” says Booy. An Advanced Partner of the AWS Partner Network (APN). PolarSeven is an IT consulting company specializing in cloud technologies. For more information about how PolarSeven can help your company build and manage your AWS environment, see PolarSeven’s listing in the AWS Partner Directory. A Premier Partner of the AWS Partner Network (APN). Bulletproof is an end-to-end cloud services provider. For more information about how Bulletproof can help your company build and manage your AWS environment, see Bulletproof’s listing in the AWS Partner Directory. To learn more about how AWS can help Datacenter Migration, visit our Databases details page.